A new campaign aims to start giving popular names to the hundreds of alien planets that have been discovered around the Milky Way galaxy. The space-funding company Uwingu announced this "Adopt-a-Planet" effort today (May 1), asking the public to propose and vote on names for the many and varied worlds now known beyond our solar system. 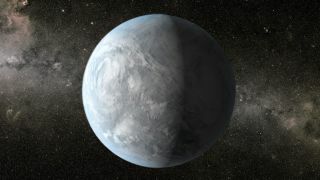 The new adoption effort, however, is open-ended and seeks names for many different alien worlds. "We're happy to have winner after winner after winner," Uwingu CEO Alan Stern, a former NASA science chief who also heads the agency's New Horizons mission to Pluto, told SPACE.com. "There are plenty of exoplanets out there." Nominating a name costs $4.99, and voting will set you back 99 cents. Uwingu (whose name means "sky" in Swahili) will use the money raised by Adopt-a-Planet to fund grants in space exploration, research and education, which is the company's main purpose, Stern added. Uwingu also sees the campaign as a fun way to get people more interested and involved in science. "We're engaging the public with the sky and astronomy in a way that's never been possible before," Stern said. The names people propose for Adopt-a-Planet won't become the alien worlds' "official" astronomical names, Uwingu officials say. Rather, they'll be common monikers, much like "The Milky Way" or "The Whirlpool Galaxy." The International Astronomical Union has traditionally approved official names for celestial bodies. So far, the organization has not moved to change the planet-naming status quo, in which alien worlds take the name of their host star along with a lowercase letter. The first planet discovered in a particular system is designated "b" (since the star is implicitly "a"), the second "c" and so on. Astronomers first confirmed an alien planet orbiting a sunlike star in 1995. Since then, they've discovered more than 700 exoplanets (or more than 800, depending on whose tally is consulted), with thousands more awaiting confirmation by follow-up observations. For more information on the Adopt-a-Planet campaign, visit Uwingu's website here.